The New Orleans Saints are searching for stability at the place kicker position, and are hoping they've found it with this recent move. The New Orleans Saints have apparently seen enough of place kicker Zach Hocker to decide that a change is needed. 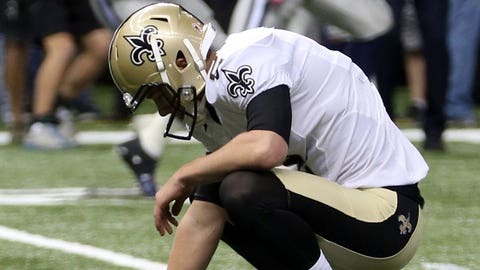 After missing a 30-yard field goal at the end of the game against the Dallas Cowboys, then missing two field goals, two weeks later against the Atlanta Falcons, the Saints made their move. According to Ian Rapoport of NFL.com, New Orleans has chosen to release Hocker, and have already signed his replacement. Kai Forbath will be the man in New Orleans now, as he was released by the Washington Redskins after Week 1. During his opening week performance for the Redskins, he went 1-for-2 on field goals, missing a 46-yarder. Forbath had been with the Redskins since 2012, making 87 percent of his kicks during that time, so the Saints at least know they’re getting a kicker with a proven track record of consistency.